With Memorial Day right around the corner, it's important to remember why we celebrate it. While it's fun to have an extra day off work and be outside, it's also about remembering those who fought for our country and made the ultimate sacrifice. A brief history - Memorial Day honors the men and women who died while serving in the U.S. military. Originally known as Decoration Day, it originated in the years following the Civil War and became an official federal holiday in 1971. The poppy is also the official memorial flower of the Veterans of Foreign Wars of the United States. Veterans in VA hospitals across the United States assemble “Buddy Poppies”- little, red artificial flowers that people can wear in memory of members of the military who were killed in action. Now that you know why we celebrate Memorial Day and make Poppies, you're ready to learn how to make one! Then you'll want to gut all four pieces by pulling out the inner strands. 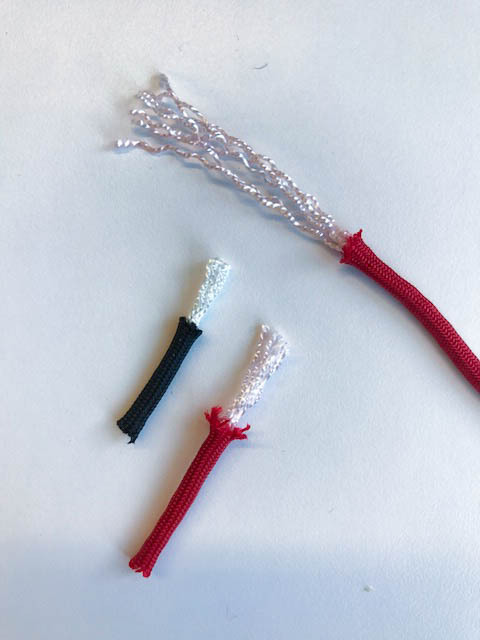 Then you carefully pull apart the ends of the longer red strand as shown below. This forms the base and outside "pedals". Then you'll want to do the same thing with the smaller red cord. However, you'll want to do it less wide because this one will sit inside of the longer red cord. Next, do the same with the small black strand, but again, not as much as the shorter red cord. Now, you don't need super glue (I've done some with and some without), but it will help it stay together. Put a small dab of the glue on the top inside of the longer red strand and carefully place the shorter red strand directly in the middle. You will likely want to shorten the base of the shorter red strand so it has a VERY small piece that isn't "fluffed" out so it will sit as close to the longer red strand as possible. Now you have a little more full look to the pedals. Do the same with the black strand. Next, you can do whatever weave you like to form the stem, here I did the Cobra/Solomon. Finally, cut off the excess green and red cords and you're done! 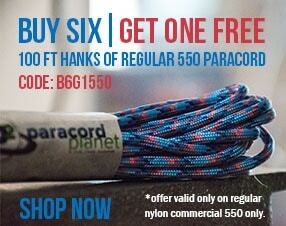 You have paracord poppy to wear on Memorial Day! If you'd like more patriotic crafts, check out this blog on 4 Ways to Show Your Patriotism. 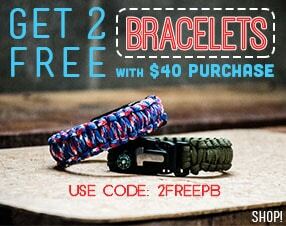 It has a couple great red, white, and blue bracelets you can make!